Newly discovered tiny octopus-like microorganisms have been named after the fictional monsters created by American horror author H.P. Lovecraft. The single-cell protists, Cthulhu macrofasciculumque and Cthylla microfasciculumque, live in the gut of termites and help them digest wood. The scientists say in a release that they decided to name the creatures after the Lovecraft monsters as "as an ode to the sometimes strange and fascinating world of the microbe." 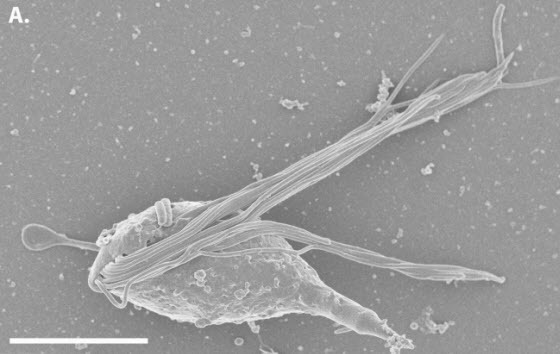 UBC researcher Erick James, lead author of the paper describing the new protists, says, "When we first saw them under the microscope they had this unique motion, it looked almost like an octopus swimming." The octopus-like movements and appearance of both protists reminded James of the horrid Cthulhu and Cthylla. Lovecraft described the Cthulhu as "A monster of vaguely anthropoid outline, but with an octopus-like head whose face was a mass of feelers, a scaly, rubbery-looking body, prodigious claws on hind and fore feet, and long, narrow wings behind, along with a large jugular vein." Cthulhu and Cthylla are very small. They are in the range of 10 to 20 microns, which is why they had not previously been identified. Most of the larger protists living in termites - that have already been identified - are around 50 to 150 microns. The research paper was published here in PLoS One.